Before your wedding, you’ll get to know our office & events team like an old friend! 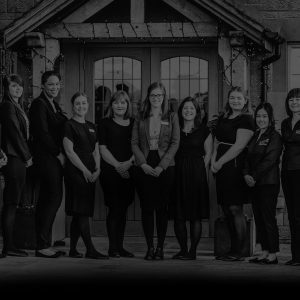 These are the smiling faces that will greet you when you first come to look around our venue, and they’ll stay in touch throughout all your planning. Our office staff will ensure all your organisation goes super smoothly and if ever you start to worry about something, they’re just a phone call away. And on the big day itself, our events coordinators will do just that – coordinate every little detail, so you can just enjoy the celebrations. Why did you start Heaton House Events? As a mobile DJ of 15 years I have always loved creating a good party atmosphere and seeing people enjoy themselves, so when I realised we lived in a beautiful venue it seemed a great opportunity to not only share this space but also give people a great time with friends and family. As it was such a great experience, people wanted us to recreate it at other venues and events so the events company was born! What do you spend your day doing? Dreaming about the next project to further enhance the services we offer! Feeding my girls (the cows, yes, it is still a 165 acre working farm!) and supporting our amazing team in whatever shape or form they might require. What’s the best thing about working at Heaton House Events? I love working with our team. The mix of staff and their different skills and personalities makes it very interesting and diverse. Its great to watch the younger members develop their skills and abilities throughout the years too. What's your proudest achievement whilst working at Heaton House Events? My proudest moment was when we were announced winners of the Best wedding and events team in the North West in the wedding industry awards. We have always believed that we try hard to do a great job but it is really nice to be recognised for it. Another proud moment has to be the annual festival, Triplefest. Last year we handed over £21,000 to charity and it's a great feeling to know the money is going to great causes. As its all ran by volunteers, it brings the local community together, and some neighbours get to meet each other for the first time! What top tip would you give for a brilliant event? Listen to those who have done it before, experience speaks volumes!!! We opened up our family farm to couples for them to use as a wedding venue back in 1999. As the business grew and grew, it seemed like natural progression to improve the service that we offered and started the events management company, Heaton House Events. I love meeting couples and showing them around my beautiful venue. When I get the time I love being creative, so I bake our famous home-made banana loaf for our accommodation guests, and enjoy titivating the water gardens. I also support the laundry, housekeeping and venue teams to ensure everything is finished to a high standard. Working with such a great team to make sure that every event is brilliant, also, I don't have to travel far to work! Not only watching it grow from a farm, and hosting our first wedding to a successful, busy company, but winning The Wedding Industry Awards best Events Team in the North West for two years running! What would you say to someone who is looking to join our team? We all work together to have fun and to make the best day possible for all of our brides and grooms. Also, we love smiling faces! Why did you want to join Heaton House Events? I was excited to take on a new role at Heaton House Farm and then become part of the Heaton House Events family following our transition into an Events Management company. Wow - how do I describe my varied job? Recruitment, HR, Payroll.... everything behind the scene of an event! The great thing about my job is that no day is ever the same! I love the variety. It isn't a 9-5 role so the flexibility allows me to attend my children's sports day and other commitments. I feel lucky to have such a flexible job while having a young family. What top tip would you give our couples for a brilliant event? Ensure that you have good food - everyone remembers great food! I have been involved in events since I was 4, it's in my blood! My parents organised a family fun day and since then it has grown in to a 3 day weekend called Triplefest. Back in 2000, my family took the decision to diversify the farm to a wedding venue and I can remember getting off the school bus, running in to the barn with my bags dropping them on the floor and help my Mum place favours neatly around the table. Needless to say, I have a keen eye for detail and enjoy wandering around the events taking place making sure everything is set up perfectly. It really varies! One day I can be researching a new system to improve our services that we offer, to another where I can be launching it! I also look after our on-line presence such as keeping the website up to date with images that photographers send us of past events, and of course social media, which now makes up a massive part of the service that we offer. Our clients are always messaging or tweeting me and I love replying back to them, so if you ever wondered who it was replying; now you know! The people! Whether it's my colleagues, or clients - they are all great! Literally starting from the bottom and working through many different stages, I've had many roles through my time with Heaton House Events, I've developed them and they've developed me. My most recent achievement would have to be when we won The Wedding Industry Award for best Events Team in the North West, not only in 2015, but 2016 also - so proud! Come and have a look around, meet the team and see what all the fuss is about! What top tip would you give to our couples for a brilliant event? I'm going to have to do two... 1 - Don't follow blogs or magazines word for word, after all, they are writers and might not have much event experience. The best advice can be achieved from chatting to suppliers and asking for their extensive knowledge, they know who they work well with to achieve the best results. 2 - Create a brand. Some of my favourite events have featured a unique monogram. This has been on the event invites, which really sets the scene with the guests, and even featured on the dining table stationery and on gobo lighting looks great too! I have always wanted to work within the events industry. After completing a work experience placement at Heaton House Events during my degree, I decided that once I had finished university I wanted to join the team! Being a family run company means that everything has a more personal approach. I like to get to know my clients and in a venue such as Heaton House Farm, it is easier to offer that individual attention to each event. I spend my day showing our lovely clients the fantastic services we have available, helping with suppliers and planning, meeting my clients for a final chat about their big day, calming any last minute nerves and then ensuring that every little detail that is important to each individual is accounted for on their special day. The best thing about working at Heaton House Events is the lovely people, the variety of events that our wonderful clients create and, of course, being able to look out over the rolling countryside. My proudest achievement was my first ever wedding at Heaton House Farm. After intense training over a 2 month period, I ran my first wedding in 2012. After following every detail on the planner, the whole wedding ran so smoothly and I have loved weddings ever since! Do it! We are a friendly bunch who welcome people into our Heaton House family with a smile! No day is ever the same, meaning that working for Heaton House Events is an exciting place to be. My top tip would be shop around for your suppliers, don’t rush into booking someone, ask your venue and get a feel for the supplier’s style before committing. I would also encourage clients not to get too wrapped up in making everything match, if you like it, go for it! We love to see client’s personalities shine through on their big day. I wanted a change of direction in my chosen career path and was really interested in moving from operations into events management. After researching Heaton House Events as a company I really liked their approach and that it was a family run business managing a variety of different events. No day is ever the same which is the main thing that I enjoy. One day I could be office based answering emails and phone calls, whilst the next day I can be on my feet for 10 hours running a function that I have helped to plan. The diversity is great! The best thing is all of the different clients that I get to meet, ranging from couples for weddings, charity events or corporate meetings. Becoming part of the Heaton House Events team and getting to plan some amazing events! Go for it! Heaton House is a brilliant place to work with an amazing team and lots of different events that will challenge you daily. Plan, plan, plan! Part of this is ensuring that you book the best suppliers that your budget can stretch to because this will ensure your event runs smoothly and helps to create the event you envisage is created. When I saw the role advertised I knew it was something I would love to do. After spending many years working within the hospitality industry and really wanted to concentrate on events. Heaton House was the perfect place to do this. I loved the fact it was family run just appealed to me. What do you spend the day doing? Anything and everything! The days just fly by. One day I can be in the office answering emails and showing couples the venue then the next day I can be running an event! It’s all about helping all our clients, giving them a stress free day so that they can enjoy themselves! The variety within the job, you never know what may happen when you arrive at work! Never are two days the same. Also working alongside such a brilliant team, they are supportive and more friendly than you can possibly imagine. What’s your proudest achievement whilst working at Heaton House Events? It should be reworded ‘proudest moments’ as every time I read a review or a thank you card from past clients saying how grateful they are for everything the team does, it always makes me proud that we achieved and exceeded their expectations! Nothing beats that feeling. Just do it! You won’t regret it, you will be working for a great company, alongside an amazing team in a beautiful location! What more I can say?! The key is organisation. Ensure you have a super organised team who can plan and run an event for you! I had just graduated from University in a subject I then didn’t want to continue with and I was very much lost. My brother spotted a receptionist role at our local wedding venue and so I went for it. The team here took me under their wing, looked at my skills and have now developed and trained me in marketing, and I’ve never looked back. I am absolutely loving my new role in marketing! My day consists of scouting through stunning photographs from the weddings that have taken place here, Pinteresting, hash-tagging, writing blogs and content for the website and then when we have guests stay I look after them and check them in and out ensuring they have a lovely stay. I also love showing newly engaged couples around the venue, it's amazing to be a part of their wedding planning experience. There's never a quiet moment here but if you ever have something you need help on, there is always a helping hand. It's all about being a team here and it was fantastic to stand on the stage with my colleagues at The Wedding Industry Awards and accept the Best Events Team in the North West! When I joined Heaton House Events I was very much a city girl, patterned fashion wellies and fancy fur coats and hats, and I had a huge fear of animals! After a few months here you can now catch me walking through fields with sheep and stood in the middle of cows with a bull staring at me! I DIDN'T EVEN RUN AWAY! Come along, give 100%, use your skills and they will be put to good use and there is room to progress internally. Not everything in life comes easy, but with hard work and a helping hand, anything is possible! You have just got to make sure you enjoy it along the way.